What Languages Are Spoken in Russia Besides Russian? It’s very easy to assume that, in a country one doesn’t know much about, only one or two languages are spoken. This may be the case in some extremely small countries, but Russia is the largest country in the world in terms of land area. There are also 160 different ethnic groups in Russia, and about 100 languages spoken by these groups. 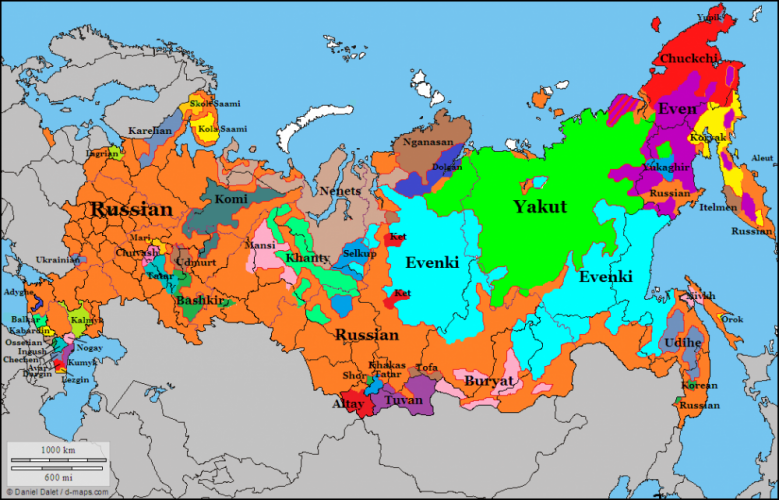 The linguistic diversity found in Russia is just as astounding as the ethnic diversity, even though it is a country that belongs to two different continents. The language of the Volga Tatar ethnic group, Tatar is spoken by some 6.5 million people as a native language. Besides Russia, where it is a native language, it can be found in Ukraine, Finland, China, Romania, Turkey, and other countries. Tatar is a Turkic language, which means it shares characteristics like vowel harmony, agglutination, and more with other Turkic languages such as Turkish, Uzbek, and Kazakh, for example. It is the official language of the Republic of Tatarstan (along with Russian), a republic that forms part of the Russian Federation. Chechen is the language of the ethnic group of the same name, whose members can be found mostly in the Chechen Republic/Chechnya, which is part of the Russian Federation. Chechen is a Northeast Caucasian language and has at least 8 different dialects. Many of the sounds and consonants of Chechen are very similar to those of Arabic and some of the indigenous languages of the Pacific Northwest. The vowels are very similar to those of German and Swedish, giving the language an interesting mix of sounds. Depending on the dialect, Chechen can have between 40 and 60 consonants. Part of the Mongolic language family, Buryat is considered either a Mongolian dialect group or its own language, depending on which linguist you ask. Besides being spoken in Russia, Buryat is spoken in northern Mongolia and parts of China as well. Though it is a Mongolic language, Buryat is written with a modified Cyrillic alphabet in Russia. There are about five different dialect groups within Buryat, with its closest linguistic relatives being Mongolian and Khamnigan. Buryat has eight grammatical cases and uses vowel harmony. Another Northeast Caucasian language on the list is Dargwa, the language of the Dargin people of Dagestan, a republic that is part of the Russian Federation. Dargwa forms part of a dialect continuum that includes Itsari, Kubachi, Chirag, and Kajtak, with Dargwa being the main dialect of the group as well as the literary dialect. There are around 490,000 native speakers of Dargwa as of 2010, most within Dagestan but some in neighboring republics. Dargwa has about 35 consonants and is written using the Cyrillic script, like most languages native to Russia. Alpha Omega Translations is a translation, interpretation, and desktop publishing company that is dedicated to providing services in as many languages as possible, both common and uncommon. For an overview of our translation expertise, visit our website translation and localization page.